Wild West Online vs RDR 2: Which is the better? The newly founded developer studio 612 Games would like to give you many freedoms with their upcoming Sandbox style MMORPG video game Wild West Online. You can go as a gangster in the huge, open game world and steal from other players or banks or you'll become a sheriff and defend the cities. However, Wild West Online will be more than just a kind of "cowboy and Indian" game in which there is only good vs. evil. Anyone who wants to earn his livelihood as someone who is looking for raw materials in the wilderness can also take this path. For example, it is possible to find a mine and dig gold there that you sell in the city. But the mine will somehow attract bandits, so it is advisable to pay with the money players who protect you. Thus an economy driven by the players is to arise in the game world, because also crafting will play an important role, which functions by means of recipes. The game will also allow gangs to organize, hide hiding places, and plan their next raids. Wounds can break out between the individual gangs. Head hunters and sheriffs then try to dig these gangs. By the way, there will be only fights between players. NPCs will not be able to collect the money for a player. The interaction between the players should be the focus. At the moment there are no quests planned, but that could change. At the moment, some elements of the game are not yet elaborated, for example how to improve the character and the consequences of a hero's death. For the end of the month, a kickstarter campaign is planned for the game, over which at least 250,000 US dollars are to be collected. In any case, the basic game should appear regardless of whether the kickstarter campaign is successful or not. This is only intended to provide additional financial resources that can be used to implement more features. The release of the basic game Wild West Online is even planned for the end of this year. Then decide whether the players prefer to play the online mode of Red Dead Redemption 2 or Wild West Online. - The focus on PvP and few PvE content could appeal to only a small part of MMORPG fans. 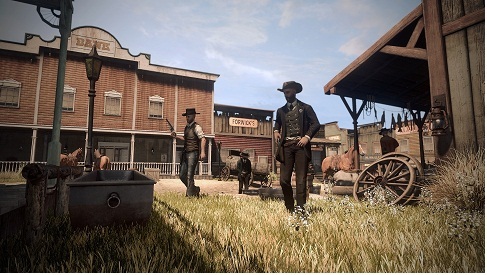 - The game will have a hard time with Red Dead Redemption 2 as a competition whose online mode is likely to hit in the same slot.